This is an addendum to an article published in the Winter 2005 edition of Woodturning Design. If you have comments, questions, or suggestions I'd enjoy hearing from you. Just send me an email. My address is David@DavidReedSmith.com. If it's a suggestion I'd be happy to post it along with this article. Let me know if you would like your email address posted as part of the attribution, or limited to only name, or only first name, etc. I've been working on a set of Tube Ornaments to give as Christmas Presents. The picture above shows a couple of things I've discovered to make things easier. I've drawn my layout on a melamine rectangle (paper taped to plywood would work as well. 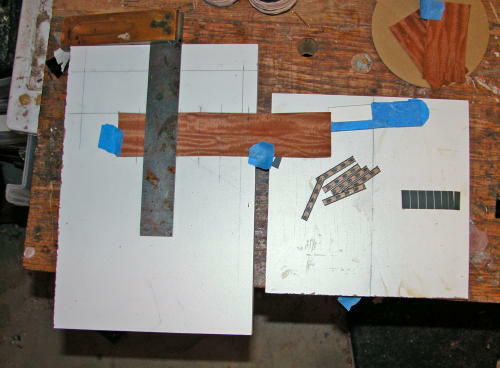 By taping the veneer to the melamine, I can use my square to draw cutting lines for the pieces right on the veneer, rather than using a template. Doing it this way, cutting errors tend to cancel each other out rather than add up. I end up with more even veneer segments. The blue masking taped thing on the right hand piece of melamine is an edging cutting aid. It's two pieces of cardboard taped together. The top piece is covered in tape. It makes it easier to hold the edging square while cutting it with scissors. I also use the right piece of melamine to make small pieces of electrical tape for piecing the veneer and banding together. I put the tape on the melamine (comes off cleanly) and cut it into segments with a utility knife.